The star of last month's Meg, Judge Dredd in Monkey On My Back, continued to entertain. So good, I read it twice - and not because I didn't understand the first time - but because it's that good... The high page count for each episode works well, and is a great idea. I'd like to see more of these longer episodic stories in the Meg. Apart from Gordon Rennie ranting about office buildings, there is still little else in the way of text stories or articles. With Thrill Power Overload ending, perhaps we will see something different in the next Meg? And finally...Chris Haynes of Sowerby Bridge writes to Dreddlines to say how much he enjoyed Juliet November, having read it several times, and how into Family he is. So completely the opposite to me then. Of course, I'm right and he's wrong :-) Goes without saying ;-) In all seriousness, this is why the Meg is so cool. Different types of stories which appeal to different types of readers. Have I encouraged you to pick up a copy yet? 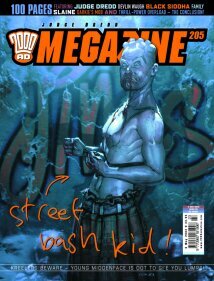 Meg 201 - I say, Dredd..